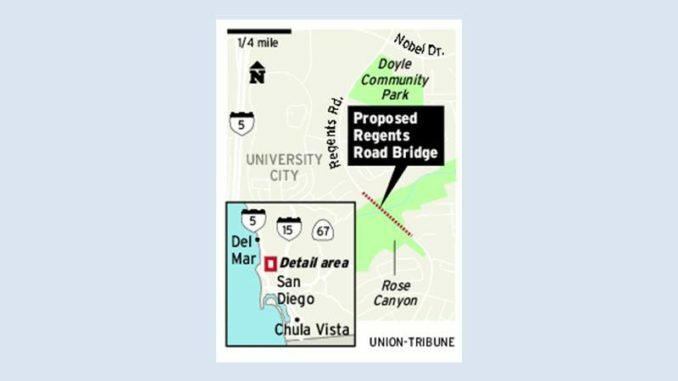 San Diego has roughly $100 million to spend on projects in University City because of the decision not to build the Regents Road bridge. The money will likely be spent on smart stoplights, expanded libraries, new fire stations and park upgrades. The city will soon create a list of priority projects based on community input. Now that litigation that aimed to revive the bridge was dismissed last month by a judge, city officials say they must decide how to spend developer fees that would have paid for the connector bridge and a related widening of Genesee Avenue.